I'd like some noob advice... I'd like to use win 10 enterprise, but I don't know how the process works. Congratulations @s1ave77 for this great work. Figured it might be an idea besides checking for online status and wuauserv to check for other relevant services and ticket apply response likewise, This will give better error handling in general and will redo the process with fall-back-method (SKUID in TargetSKU.txt instead of auto-detection) in case the ticket apply fails firsthand. Can anyone confirm if upload.ee is working or it's down ATM ? Can reach it and the numbers increase. It's not working for me, tried with 2 different ISPs and the same result "This site cannot be reached"
It's CONFIRMED: It has been blocked here in Egypt. Although I'm Real Madrid fan; however blocked also for me. There's also a nofile.io mirror at OP . However the nofile.io is also blocked by my ISP. I'm expecting all those servers ending with io, ee, .... etc will be blocked in the same manner. Ditch Seed4Me and SecurityKISS, they are crap and additionally keep several logs. NordVPN is quite good, ExpressVPN, Windscribe and Ivacy are realy good. Hello, I am new and this will be the first time i use a method of this sort to install Windows. And I want to quickly thank @s1ave77for his time and effort on creating this. 1) Can i go from Home to Pro Education, Home to Pro Workstation, or Home to Enterprise the same way I would do going from Home to Pro? If going from Home to Enterprise for example, would I need to do anything different? 2) Do I need to create a bootable USB or burn an iso to DVD of the version i want to upgrade to before doing anything in the above question? 3) If I decide to use the automated method, do I need to run everything in both the Silent﻿ Mode zip and HWID.KMS38™GEN DOWNLOAD zip? I know I'm definitely overthinking this process, but I would rather be safe than sorry. I see many people here go from Home to Pro, but I don't see any mention of people going directly from Home to something other than Pro. Enter any retail key or even the generic key for the corresponding edition. The automated method scans your system and automatically switchs to the corresponding method, KMS38 for LTSC 2019 & HWID for others. If you selected the automated method, then all you need is to wait while the tool automatically activates your system. PS: If you're going to upgrade, don't use the tool to activate except after you have completed the upgrade process; otherwise you'll encounter an error message while trying to manually enter the product key for the edition you're going to upgrade to, and in all cases you don't need to activate the edition which you'll upgrade to another. To summarize: use the tool to activate your final edition. There's also a tool that can do this called "License Switcher" don't know if @S1ave77 is a sharer in it or not !! I did't use it before. I want to thank @s1ave77 again and thank you @DR_ADHAM for responding to my questions. I have successfully upgraded form Home to Pro with no problems at all. I do have a few questions regarding my process for anyone to answer. 2) disabled internet and entered product key for Pro (computer updated as expected). I also want to add that my MS account was linked to Win Home before doing all of this. 3) computer rebooted, but when logging into my profile, my regular password(which worked in Home) did not work. I had to use my MS account password. 4) Performed automatic method, and ran hwid.kms38.gen.mk6.exe as admin. I selected REARM from drop down and program initiated and computer restart. Computer rebooted and nothing seemed to change and Pro was not activated. 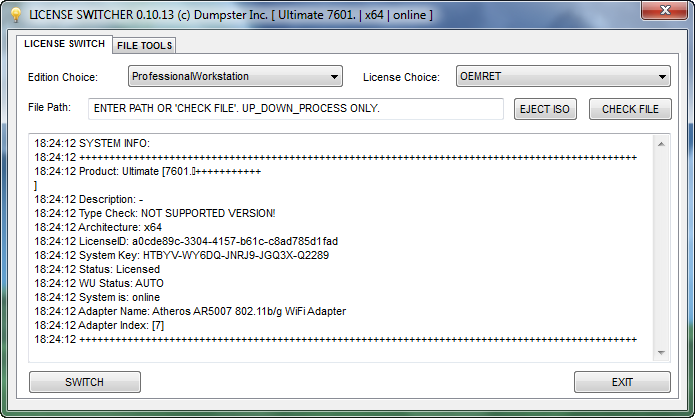 5) ran exe again and chose HWID from drop down, and activitation was successful. Why did I have this password problem in step 3? My question is, what exactly does "REARM" do? And did i cause myself any potential problem by running it in step 4? I'm assuming there are 2 ways to run automated method, the first being the executable, and the other is using .cmd? So if I understand correctly, you setup a text file to the specification needed, save it as a .cmd, then just run the cmd file? This is suppose to be faster and save a few steps compared to running the exe? I read many pages back that it was difficult to activate if Windows was a fresh intall, is this still the case? Would the process be exactly the same as I did above if I installed Win via usb on a brand new computer? And lastly, when should you use KMS38 vs HWID? Because you upgraded using the MS account as the Administrator account; so after upgrade the new system is by default has the settings related to that account including its log in password. Both are almost the same, no advantage of one over the other; although I prefer the GUI version. You just have to click instead of having to type in the CMD version. No, at all. Those activation issues in most cases are related to the machine itself not the tool. 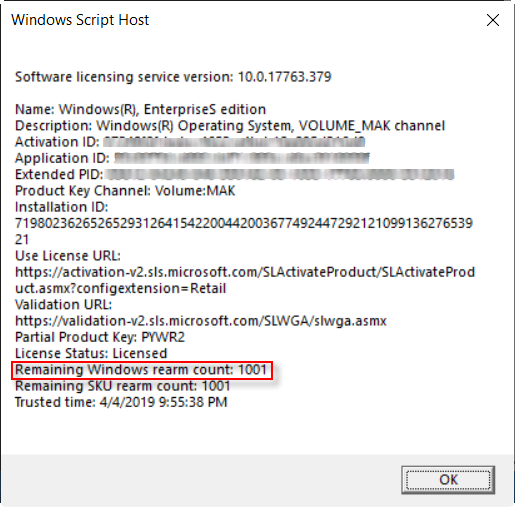 KMS38 for Win 10 Enterprise LTSC 2019 and HWID for all others including LTSB 2015 & 2016. HWID will give you a digital license activation which will be linked to your hardware, so you can reinstall the same Windows on that machine and it'd be automatically reactivated even if you used a blocked key or if the digital license activation was linked to a MS account, Windows will be automatically reactivated by just signing in with this account (without entering any keys - What to understand is that digital license activation "HWID" is the concept of MS of Windows 10 activation made easy). Unlike all others, no digital license for LTSC 2019. By default this edition has 10 years of support: 5 years of mainstream support + 5 years of extended support, being released in 2018 so MS would continue to support it for 10 years (until 2028). The tool KMS38 (long life KMS activation) will provide double that period provided by MS, meaning it will provide 20 years until 2038 and hence the name KMS38. FYI: Although rearm is useless on Win 8 and upwards,since there is no Initial Grace Period one ould return to, it can be used to clear borked activation tokens or break the 180 days KMS lock. Additionally each Audit Mode run will consume one rearm, for that reason the count was increased from max 5 on Win 7 to 1001 on later versions. Rearm count can be reverted, Win 7 - Win 10 1607 can do it directly, later versions need an extra WinPE step. actually LTSC 2019 (v1809) is supported until January 2029, if you look at the MS Win10 release information page carefully & on this MS support lifecycle page about LTSC 2019.